On Friday 8th September I stood at a bar and watched as hundreds of people poured into the Printworks like a scene from a zombie film. Some ran. Some screamed. On Saturday 9th September I saw the horde from the other side and felt my anxiety rising in my ears. I promptly walked outside, bought some ice cream and sat on the floor. On Friday 29th September I strolled into the Victoria Baths, bought a glass of beer, sat down on a nearby bench and sighed happily. Others trickled in alongside me. It’s so difficult to talk about the experience of being at a festival when you can’t tell whether the voice you’re speaking with is that of an irritated bartender, an anxious patron or a beer blogger with green tile tinted glasses. Was the stag-do vibe of Beavertown Extravaganza a quirk of the London beer scene or am I just bitter from too many “what’s the strongest you’ve got?”s? Were the initial minutes of the Extravaganza the actions of a reasonable crowd of excited patrons or was my anxiety being rational for once? Is Indy Man Beer Con the calm in a storm of hectic concert-like festivals or am I just happy to be in the same beautiful building that first propelled me into the craft beer scene? apocalypse was in fact upon us. I finished my shift at the Extravaganza several hours earlier than I expected because the kegs at my bar were empty. The three bars alongside me had been emptied nearly an hour previously. I couldn’t see too much fault to be had. I’d served far too many people who had downed their previous beer whilst ordering from me. Of course the beer ran out! You drank like the zombie apocalypse was in fact upon us. I had the same opinion by the end of the Saturday session. I’d had six hours worth of wonderful beers and rounded it off with a cheeky Neck Oil and a marginally cheekier Gamma Ray. However I still second-guess myself. Was the rowdiness just something I miss out on by not attending many London events? Does Beavertown simply attract a different crowd? Were people notably creepy regarding Logan Plant or am I projecting my awkward drunk babbling to Melissa Cole and Nick Dwyer onto others? 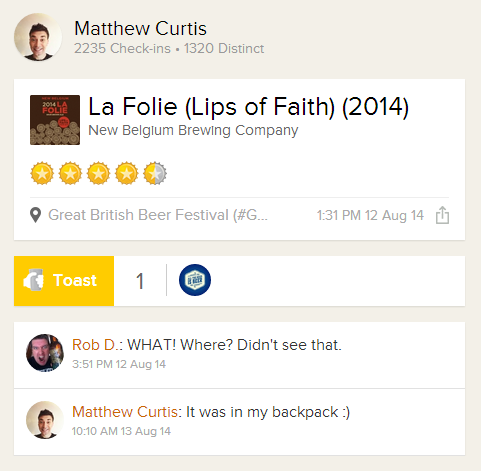 Should I be annoyed that I didn’t get the New Belgium that i’ve been waiting for since GBBF 2014 (Thanks, Matt!)? I don’t even want to begin to probe my feelings about the Wine-For-The-Wives kerfuffle. However alien Extravaganza felt to me, it felt even more so by the time I found myself on Hathersage Road in Manchester. Indy Man is my all time favourite beer festival, meandering around and periodically chatting to some of my favourite beer people before having a quiet moment looking down on the crowd or taking a drunken selfie in a cubicle. The beer is fantastic, but no more or less than Extravaganza. However there’s something else about it, the winding corridors, the unadulterated geekiness of the trade session, the familiar faces in every room, the stone steps, the green tiles, the fish mosaic… Am I romanticising Indy Man after four years of trade sessions surrounded by happy nerd friends? Or is it just better? Neither festival shied away from bright colours but Indy Man was a little easier on the eyes. However excellent Indy Man was, I finished that day feeling poor. The two September events both cost me around £70 for the day (bare in mind £50 of the Extravaganza cost way paid in labour) but I’d much rather pay for an all inclusive ticket months before than find myself handing over £2.50’s worth of plastic with a creepy face again and again. But neither one is really much more expensive than the other if you’re having around 20 different beers throughout the day. Two things I can undoubtedly say were amazing were the Good Beer Hunting Symposium at Extravaganza and Beer Nouveau’s Weird Is My Happy Place weekend. Both were highlights of their respective weekends. Not to forget, Buxton/Omnipollo’s soft serve which was available in both London and Manchester. Attending these two events in the same month exhausted me, physically, mentally and -frankly- socially. I truly wish they weren’t in the same month but is that a UK beer scene issue or a me issue? I still had a wonderful time but the fact that I spent the rest of Indy Man weekend alone, in a field, with a pretty view and some takeout cans was more than a little invigorating. And yet, a month on, I still can’t quite get my thoughts straight. Two blog posts that really struck a chord with me this summer were from Peter McKerry back in early September and from Emma (of Crema) on this year’s Indy Man. I highly recommend you give them a read. Previous Goodbye to The Craft Rooms, we barely knew you.